Most comic books produced by major publishers are printed outside the US and are produced in the multiple thousands. Popular titles from Marvel and DC are printed in the tens of thousands. If you’re an independent artist or comic book writer these numbers can be overwhelming and cost prohibitive. 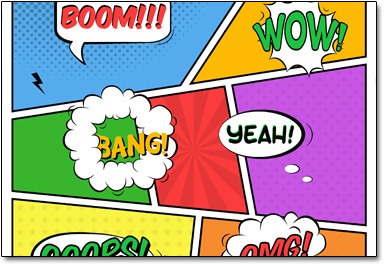 A standard comic book is printed on a thin stock, almost newsprint type with a glossy type cover paper. Offset printing has historically been the print process used but again the process doesn’t lend itself to small quantities. We can print on a variety of different stocks and with no minimum. We also print in many different sizes. A standard comic book is 7x10, but we can do smaller or larger if you want to create a unique book. We offer stocks that are slightly heavier than typical newsprint stock. These create a high-end look and feel. A typical minimum number of prints with offset is 500 or more. With our capability we can print as few as one and we print on demand, so you print as few or as many as you need. We can generally have orders ready within 48 hours. Several of our customers have their comics for sale in local comic book stores such as House of Secrets in Burbank. We can consult with you to determine the best options that will fit your needs. Zine is the abbreviated word for “fanzine”. Fanzines first became popular within the science fiction community of the 40s and 50s. Fans of the genre would create their own magazines focused on what interested them the most. These would be printed in small runs and then traded or sold within the same community of fans. 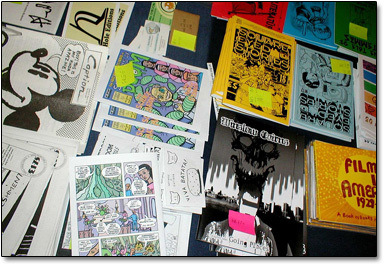 Zines have been a vital part of the comic book, artist and music scenes for decades. Prior to the internet and social media, they were the primary connection between fans of music, movies, comics, etc. They’re still a great way to promote your work to likeminded people. We understand how vital the zine community is for independent artists and writers, and we want to help you stand out in the community. We can print zines in any quantities and most any size on a variety of stocks. Since we print on demand you can print as few or as many as you need. We can work with most any budget and turn times.